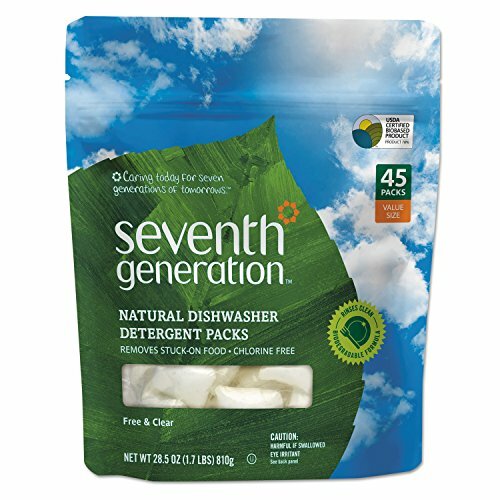 Seventh Generation 22897CT Natural Dishwasher Detergent Concentrated Packs, Free & Clear, 45 Per Pack (Case of 8 Packs) by Seventh Generation at Blog Free Here. MPN: SEV 22897CT. Hurry! Limited time offer. Offer valid only while supplies last. No mess, no worries, no residue. Easy-to-use packs give the perfect amount of grease-fighting power for a total clean, leaving no iffy scents behind. No mess, no worries, no residue. Easy-to-use packs give the perfect amount of grease-fighting power for a total clean, leaving no iffy scents behind. Simply place one single-use pack into dishwasher to remove grease, grime and even dried, stuck-on food. Enzyme-rich formula cleans without phosphates or chlorine. Free & Clear of dyes and fragrances. Scent-free and a natural choice for those sensitive to scents.